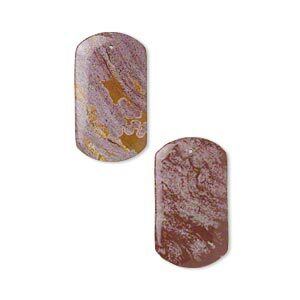 Focal, ocean jasper (natural), 45x25mm dog tag, B- grade, Mohs hardness 6-1/2 to 7. Sold per pkg of 2. Item Number: H20-9023NB Have a question about this item? Ocean jasper focals display rich hues, and natural unpredictable patterns in green, rust, grey, cream, blue, brown and caramel. From the island of Madagascar, no two stone patterns are exactly alike. Size may vary slightly. 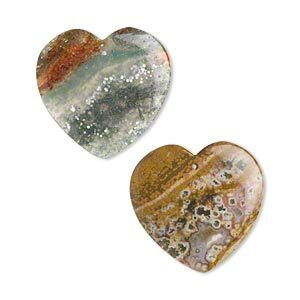 Focal, ocean jasper (natural), 36x35mm flat heart, B- grade, Mohs hardness 6-1/2 to 7. Sold per pkg of 2. 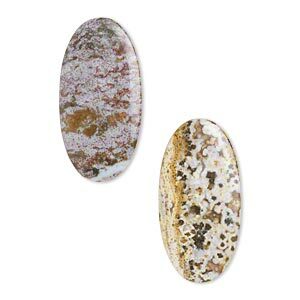 Focal, ocean jasper (natural), 52x26mm flat oval, B- grade, Mohs hardness 6-1/2 to 7. Sold per pkg of 2. 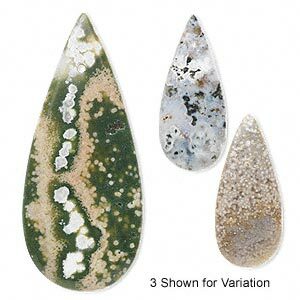 Focal, ocean jasper (natural), 50x30mm flat teardrop, B- grade, Mohs hardness 6-1/2 to 7. Sold per pkg of 2. 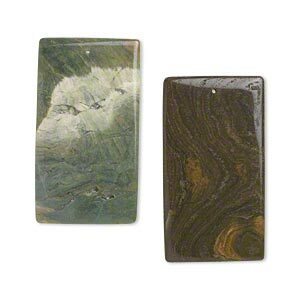 Focal, ocean jasper (natural), 64x35mm flat rectangle, B- grade, Mohs hardness 6-1/2 to 7. Sold per pkg of 2. 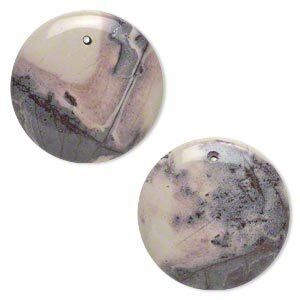 Focal, ocean jasper (natural), 42mm flat round, B- grade, Mohs hardness 6-1/2 to 7. Sold per pkg of 2. 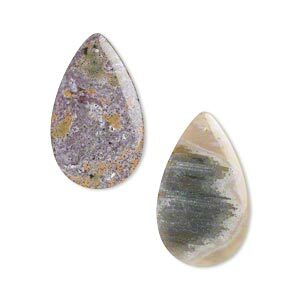 Focal, ocean jasper (natural), 52x28mm flat teardrop, B- grade, Mohs hardness 6-1/2 to 7. Sold per pkg of 2. 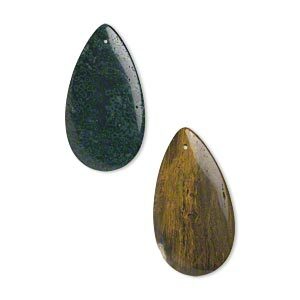 Focal, ocean jasper (natural), 46x20mm flat teardrop, B- grade, Mohs hardness 6-1/2 to 7. Sold individually. 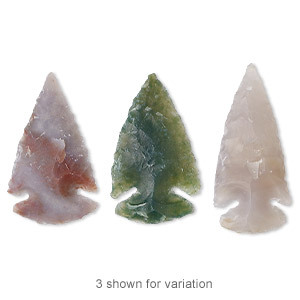 Focal, jasper (natural), 35mm hand-knapped undrilled arrowhead, B- grade, Mohs hardness 6-1/2 to 7. Sold individually. 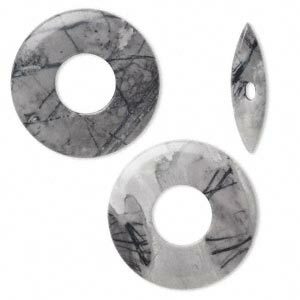 Clasp, toggle, Picasso "jasper" (onyx marble) (natural), 45x6mm round donut and 38x10mm bar, B grade, Mohs hardness 3. Sold individually. 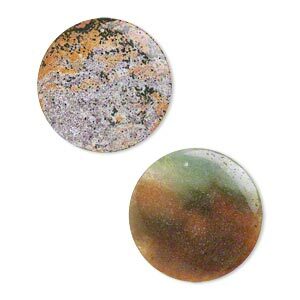 Focal, terra rosa jasper (natural), 30mm puffed flat round, B grade, Mohs hardness 6-1/2 to 7. Sold per pkg of 2.